Hey, it happens. It’s random, and it just happens. But what should you do when your friends from above leave a little present on your satellite dish? 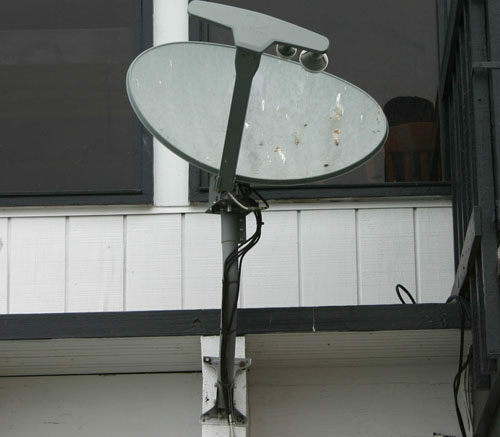 It’s kind of a quandary, especially if you’re not comfortable reaiming a satellite dish. If you scrub those nasty things off, you’ll no doubt move the dish and your reception could be affected. On the other hand, there’s no way they’re doing you any good and your reception could already be affected. In general my advice is to do nothing. If you are not having reception problems thanks to those tiny flying dinosaurs than I would not worry about it. I understand that it’s unsightly but that’s something you should probably be willing to accept. If you’re a clean freak or if you’re having signal problems, the goal would be to clean the dish as gently as possible. Never scrub the dish with a sponge because that could make it move. Soak the affected areas with something like Simple Green for several minutes and use a plant sprayer or a hose on very gently to wash things off. Be patient and you should be able to dissolve those little gifts without touching the dish. Never use a pressure washer or anything that could blast the dish hard enough to move it. Most likely though, as ugly as they are, those white streaks aren’t really hurting you and should be left alone.